BOZEMAN — A Montana State University study of Yellowstone National Park and the surrounding area shows that increased population and density, as well as a changing climate, are affecting the overall ecological health of the region. "The study quantified trends in the condition of 35 ecological 'vital signs' dealing with snow, rivers, forests, fire, wildlife and fish," saidAndrew Hansen, professor in the MSU Department of Ecologyin the College of Letters and Science. "The human population has doubled — and housing density has tripled — in the Greater Yellowstone Ecosystem since 1970, and both are projected to double again by 2050," Hansen said. "Plus, the temperature has warmed 1.5 degrees Fahrenheit since 1950 and is projected to increase by another 4.5 to 9.4 degrees Fahrenheit by 2100." Hansen, who is also director of MSU's Landscape Biodiversity Lab, co-authored the paper "Trends in Vital Signs for Greater Yellowstone: Application of a Wildland Health Index," with Linda Phillips, a research scientist in MSU's Department of Ecology. The science journal Ecosphere published the article in August. "These changes in land use and climate have reduced snowpack and stream flows, increased stream temperatures, favored pest outbreaks and forest die-off, fragmented habitat types, expanded invasive species, and reduced native fish populations," Hansen said. The study uncovered good news, too, for the habitat and some animals that call it home. Large mammals, including bear and elk, are increasing in numbers and expanding in range, according to the study. 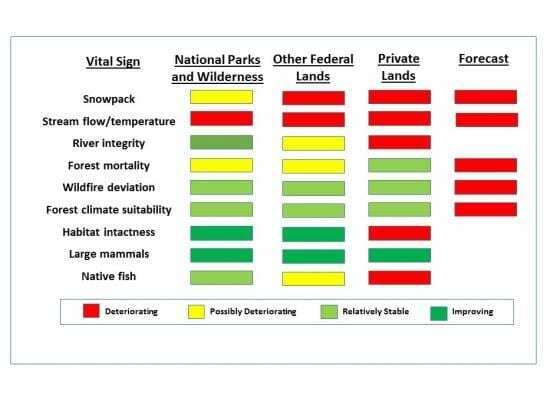 Also notable is the new methodology the MSU scientists used, called the Wildland Health Index, which resulted in a reader-friendly "report card." "Physicians use 'vital signs' such as blood pressure to gauge the heath of humans," Hansen said. "What we're trying to do with the Wildland Health Index is something similar by adding value to data that allows a variety of people to understand the trends in ecological health." To do this, Hansen and Phillips evaluated the data to identify the trends over times in the GYE's vital signs and used criteria to rate them from "deteriorating" to "stable and improving." "We then boil down the metrics to the six or eight key vital signs that will matter to policymakers," Hansen said. "And, this study can be applied each year across the GYE and used for other large wildland ecosystems in the United States to better inform land managers to assist them in sustaining these special places." Diane Debinski, head of MSU's Department of Ecology, said the index is a new tool that can be used measure ecosystem health around the world. "Because the Greater Yellowstone Ecosystem serves as an icon for wildland management, the Hansen and Phillips Wildland Health Index will have global reach, serving as a template for similar assessments worldwide," she said. Hansen noted that the ecological health of the region was strongest inside the boundaries of Yellowstone and Grand Teton national parks. That's not surprising, he said, given the focus of its caretakers in managing the ecological health of the parks. He said this study shows that the greatest need for improvement is outside the parks, where private landowners don't necessarily have access to data that may help them be better stewards of the land they own and the water that passes through it. "There's a real opportunity to let people know what they might worry about on their own property with regard to impact," Hansen said. He also indicated that there's plenty of room in the near future for citizen scientists to gather and report data that will help policymakers as they consider the overall ecological health of the GYE, which includes tens of thousands of square miles beyond Yellowstone National Park, including Idaho, Montana and Wyoming. "We have so little information about large river systems, especially on private lands," Hansen said. "There's just no consistent monitoring of water quality on those major rivers on a scale that can tell us how well they're doing, and that's surprising because so many people here love our blue-ribbon trout streams that we're famous for. "There's real opportunity to engage people to do the monitoring and the science to fill in the gaps," he added. "One could visualize high school students across the GYE doing water-quality monitoring and submitting the data to a central repository. By doing so, they become heavily engaged participants."